•Parfocal eyepiece - Little or no focusing is needed when changing from low to high power. •Threaded barrels - Accept 1.25" (5,8,13,17mm models) or 2" (22 & 32mm models) Celestron thread-in filters. The Celestron's X-Cel is a 6-element fully multi-coated optical design, the X-Cel utilizes extra low dispersion (ED) glass on its most highly curved surfaces, to minimize chromatic aberration that can hinder sharp planetary views. With a wide 55° apparent field of view, and a large 25mm clear aperture the X-Cel is one of the most comfortable eyepieces to use. Every X-Cel eyepiece is parfocal with each other, meaning little or no focusing is needed when changing from low to high power. The X-Cel comes with soft rubber eyecups and a durable plastic case. In addition, if you are an eyeglass wearer, you will enjoy the 20mm eye relief available on each of the X-Cel focal lengths. If you are looking to move up to a higher quality eyepiece the Omni series provides more enhanced features in a wider selection of focal lengths. Celestron designed this series with the finer points in mind so you, the user, can benefit from the features that make this series unique. The Omni is a 4 -element premium symmetrical Plössl optical design. Features include blackened lens edges to minimize internal reflection and maximize contrast, multi-layer coating group on each lens surface to maximize light transmission and contrast, and each Omni goes through a two-step anodising process to prevent reflection from the top eyepiece barrel, unlike most other manufactures who use reflective surfaces. Super-premium fully multi-coated 1.25" zoom eyepiece has a focal length of 8-24mm. Allows for expanded magnification options.
. Five Superior Grade Plössl Eyepieces - 1.25" - 4-element design with a 52° AFOV - Superb color resolution, edge sharpness and clarity. All eyepieces are fully multi-coated for maximum contrast and resolution. Supplied are a 6mm, 8mm, 13mm, 17mm, and 32mm.
. Barlow Lens - 2x 1.25"- Compliments the Plössl eyepieces in this kit and gives you a total of ten power combinations. High grade glass optics with fully multicoated lenses are used so there is no degradation of image.
. Six Colored Eyepiece(Lunar & Planetary) Filters - 1.25" - Included are Kodak Wratten #12, #21, #25, #56, #58A, and #80A. Since you have all the eyepieces necessary to study the planets and moon in detail, these filters will greatly enhance your enjoyment of our solar system.
. Moon Filter - 1.25" - A neutral density filter which allows you maximum enjoyment of the moon especially during the brighter phases.
. Aluminium Carrying Case - This sturdy and well-built case fits all of the above items in the die-cut foam interior and has room for additional accessories. Celestron EyeOpener Eyepiece/Filter accessory kit 31.7mm- Special offer while stocks last (SRP £199.00) - Max 1 per customer ! Five Colored Eyepiece (Lunar and Planetary) Filters - 2� - Included are Kodak Wratten #12 (deep yellow), #21 (orange), #25 (red), #58 (green), and #80A (blue). These filters will greatly enhance your enjoyment of our solar system. Eyepiece filters are an invaluable aid in lunar and planetary observing. They reduce glare and light scattering, increase contrast through selective filtration, increase definition and resolution, reduce irradiation and lessen eye fatigue. 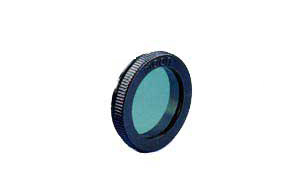 Celestron's filters are made of high quality, solid plane parallel glass with excellent homogeneity. They're anti-reflection coated to prevent glaring and ghosting.The cells of each filter are double-threaded, so they can be stacked (piggybacked) in various combinations. This allows you to create different color combinations and transmission characteristics, or to have the same color characteristic, but with a lower transmission. Filter Set #1 (21, 80A, #15, Polarizing) 1.25"
The Sun appears in its “real ”color —neutral white, not blue or orange, and the sky adjacent to the solar limb is jet black. Celestron offers a complete line of rugged, but soft Foamex plastic lens shades that can be stored flat after usage. They are made from a thicker material that won’t crack under temperature extremes. The quality level is a step above all others as all material is sewn (not glued) for a long life. A simple solution to dew on your telescope, simply wrap around the optical cell and plug in to any 12 volt power source with a standard cigar lighter socket. Supplied with a lead ten feet long this dew heater band combats dew without the fuss or added cost of a seperate dew controller. With an Orion Dew Zapper, you'll never have to stop observing to remove condensation from the front plate of your Schmidt-Cassegrain or Maksutov-Cassegrain.The flexible, fiberglass-reinforced heating element straps securely in place on the telescope with a Velcro fastener.Runs on 12-volt DC power. Plugs into a car cigarette-lighter or a power tank delivering up to 20 watts, 2 amps. All models include a 10' cable. A T-Adapter allows you to attach your 35mm SLR camera to the prime focus of your Nexstar 4SE telescope . This arrangement is used for terrestrial photography and short exposure lunar and planetary photography. It can also be used for long exposure deep-sky photography. A T-Adapter allows you to attach your 35mm SLR camera to the prime focus of your Nexstar 5,6,8 SE telescope . This arrangement is used for terrestrial photography and short exposure lunar and planetary photography. It can also be used for long exposure deep-sky photography. An Erecting prism that corrects the views from the telescope allowing it to be used for viewing terrestrial objects. Connects to the rear port of the telescope. Allows all Nexstar SLT & SE telescopes to be connected to the serial port of a PC. Fitted with 9-way D plug for connection to the serial port of your PC - the cable fits into the 4 way modular port in the base of the handset to provide full PC connectivity. For upgrades and full remote operation by PC planetarium programs (check compatibility with software vendor). Cable is available in four standard lengths: 5, 10, 20 and 30m. Allows a serial cable to be used on a PC with no Serial port. Draws its power from USB port so no extra power adapter required. No IRQ's so no IRQ conflicts. For use with CGE Series, Advanced Series, GPS Series & NexStar i Series and NexStar Series, as well as many older models, this adapter allows you to power you telescope directly via the car cigarette lighter, or Celestron`s PowerTank receptacle. This cigar plug and two sockets gets round the problem faced by many of how to power multiple items from just the one socket. 10m Extension cable for 12v AC adapter - safer than running 240v mains outside !